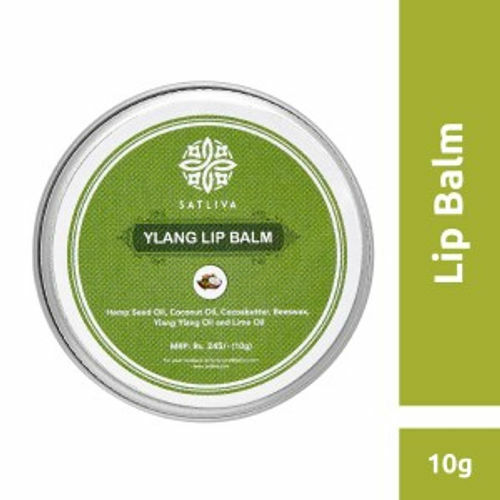 Satliva Ylang Lip Balm is named after ylang ylang oil that helps in soothing dry, chapped lips, rejuvenates them and prevents free radical damage. When exceptional natural ingredients such as ylang ylang oil, cocoa butter and coconut oil are blended together, an unusually nourishing and moisturising lip balm is made. It also contains hemp seed oil, beeswax and lime oil. Coconut oil locks in moisture and keeps the lips thoroughly moisturised and plump all the time, while cocoa butter shields your lips from sun rays, cold and even indoor heat. This organic lip balm hydrates, soothes and protects chapped, cracked and peeling lips and keeps them soft, smooth and supple. With ylang lip balm, you know you're getting only the finest natural ingredients, to nurture your lips.